Jay was an awesome host, had a great time in Hongdae! Great place for great value. Super friendly staff, homely facilities and great location. The hostel has a really chilled vibe, but there are usually people around to have a couple of beers with on the roof, or to go out and have a bigger night if you want to. Would recommend, particularly for solo travellers and small groups if you want to meet people. probably the cleanest hostel i've ever stayed. The staff are very hospitable but they forgot to give me an introduction at the beginning. people got to talk in the common room which is good to make friends. but i kinda hope they hold some activities for us to join. Anyway, nice stay there. highly recomended! The most comprehensive experience I’ve ever had at a hostel. Great atmosphere, great employees, great location—this place has it all. I was actually almost in tears when I had to leave because I had such a great time here. Great staff. Very engaging with the guest. Always willing to help you out or show you around. It’s a few minute walk to Main Street. Great location, atmosphere and helpful staff. Only issues with facilities, my bunk didnt have a dedicated plug in port and limited shower facilities. 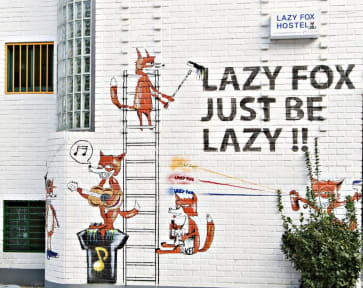 All-in-all, stay at Lazy Fox was great value. Eh, to be honest when teenagers are running the place that kind of says it all. A lot of “ backpacker tourists” who stay too long and end up with a job there run the place. The place was filthy, the showers and toilets don’t have locks so you need to knock but when the music is blaring people do walk in on each other, which is ridiculous. Its just a teenage ran hostel who’s main focus is partying every night. The place needs to be scrubbed. And maturity needs to be brought in.